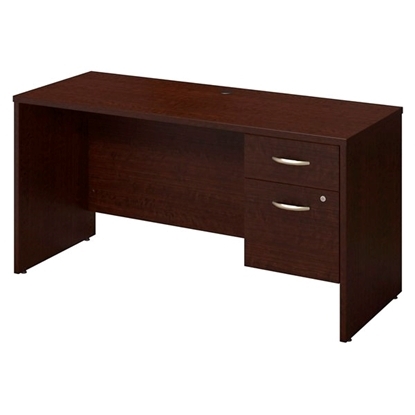 Make a statement with your home or office with a beautifully crafted executive office desk. 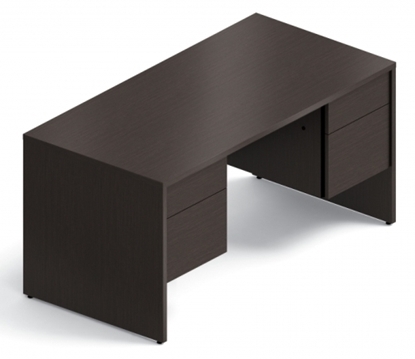 Executive desks can come in many shapes and sizes including L-shaped executive desks for additional work space. Choose from a wide variety of wood finishes including Cherry, Maple, Walnut, Mahogany or various colors from white, gray, brown, black, and more. The Genoa office desk is the perfect size for offices where space is at a premium. The eco friendly Genoa Series combines the value of laminate with contemporary styling of top over end panel design. Perfect for a small home office or business workspace. Includes warranty and free shipping. 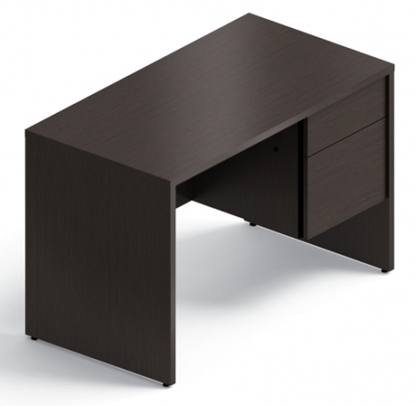 The Genoa Series office desk features contemporary design with the durability of laminate. This standard size unit has drawers on both sides for good storage. Many companion pieces available in this clean looking popular series, including credenzas, bookcases, and lateral files. Genoa Series combines the value of laminate furniture with contemporary styling of top over end panel design. Order today and get free shipping! The transitional Somerset executive office desk by Bush provides an ideal solution for both the home or business. This desk requires modest room and offers good storage space. Perfect for a laptop computer, desktop PC or tablet. Warranty and free shipping on all discount office furniture. The Bush Somerset double drawer executive desk is available in rich Maple Cross finish with tapered metallic leg accents. This desk provides plenty of drawer storage space. Fits well in tight quarters and works well in a home office. Perfect for a laptop computer or desktop PC. Warranty and free shipping on all Bush office furniture. A great basic desk in the high quality OTG Series for a great price. Two hanging pedestals for your filing needs. Available in four attractive finish options. A simple yet functional addition to any office or home office. This single pedestal desk features one box drawer and one file drawer, 1" thick work surface and end panels, and is constructed with thermally fused laminate. A great addition to any home office, den, or private office. 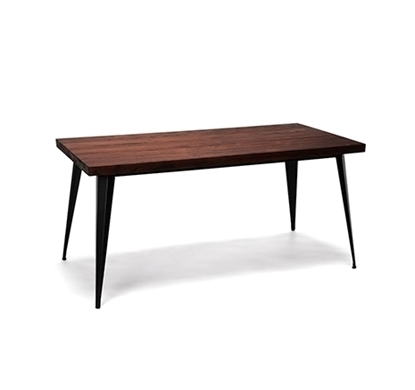 This table desk features a solid Elm Wood top with a Walnut stain finish, 2" thick wood edge, and a full steel frame for structure and support. 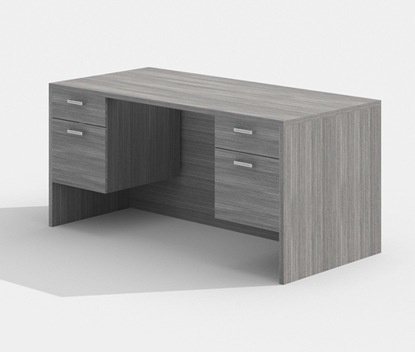 This Offices to Go executive office desk offers a clean, contemporary design with maximum drawer space. The durable PVC edge resists dents and the ball bearing slides provide smooth-riding drawer operation. Available in three different finishes. Perfect for your home office or business work space. Warranty available. Get free shipping when you order today! This Global Genoa executive office desk features our most popular 72 inch width, contemporary look, and good drawer capacity. All Global desks are eco friendly GreenGuard® certified. Available in a wide range of colors that work well in a home or business. Get free shipping when you order today! A great option for the commercial office, home office, or just about anywhere a smaller desk is needed. This desk features two hanging pedestals for all your storage needs and is available in a number of different colors. This Offices To Go executive desk features contemporary styling and the strength of durable laminate construction. With two floor height drawers, it maximizes storage capacity. Grommets provide easy wire access for a laptop computer or desktop. This desk is GreenGuard® certified eco friendly. Includes warranty and free shipping. A simple and functional double pedestal desk that is available in 4 colors. This desk comes with two hanging pedestals for all your storage needs and is a great addition to any home or commercial office setting. 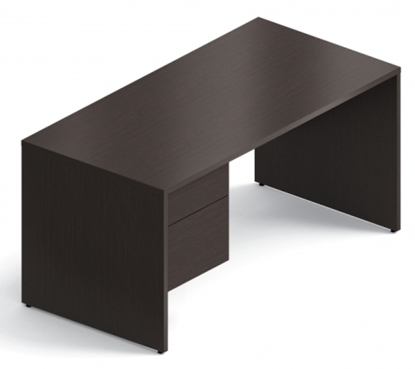 This executive desk features laminate construction and contemporary style with durable PVC "super edge". 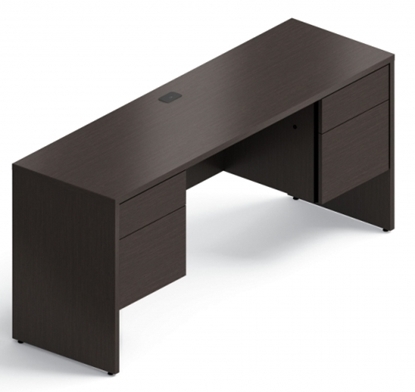 This desk provides maximum drawer capacity with smooth rolling drawer slides. Perfect for a home office or business. All Offices to Go furniture comes with free shipping and warranty. Functional and stylish, this executive desk is constructed of thermal fused melamine laminate, a matching 3 mm PVC edge, and is available in three colors. Free shipping and warranty on all discount furniture collections.